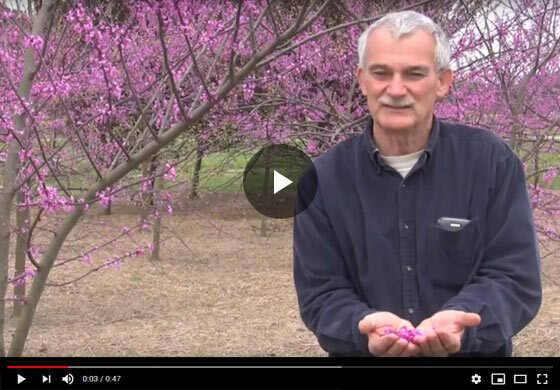 Denny Werner from Gurney's talks about Pink Pom Poms redbud, the flower's unique characteristics and the attributes that distinguish them from regular red buds. Hello, I'm Denny Werner and I'm here to talk about Pink Pom Poms Redbud. Pink Pom Poms is a new variety that we have just released here at NC State and the virtues of Pink Pom Poms are the very large double flowers, flowers that have an additional number of petals as compared to the typical red bud, which gives it a much fuller, larger appearance. In my hand, here, I'm showing the comparison between Pink Pom Poms and a typical red bud flower. Pink Pom Pom also has a very attractive color, a reddish purple color as compared to the typical purple of standard red bud . And one other attribute of Pink Pom Poms that may be of interest is the fact that Pink Pom Poms are sterile, does not make any of the red bud pods and hence you don't have unattractive pods on the tree, nor do you have any volunteer seedlings in your landscape. That can be a distinct advantage also. One other character of Pink Pom Poms is that one of the parents in its development has a very glossy leaf character and is attractive in the summer by virtue of its attractive glossy leaf.